The following diagram gives examples of adjectives clauses that use the relative pronouns that, who, which, where, whom, whose, and when. Scroll down the page for more examples and explanations. What is an adjective clause? 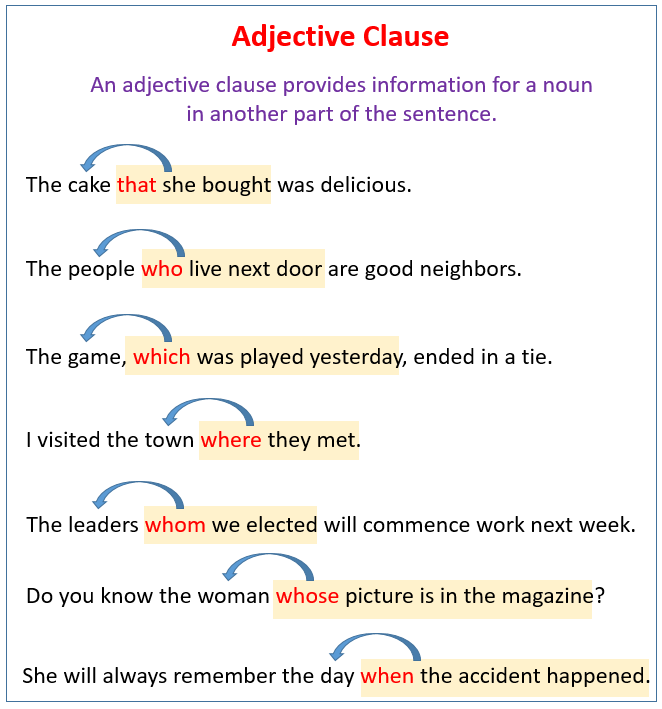 An adjective clause is a clause (subject and verb and other words) that describes another word in a sentence. An introduction to adjective clauses. Learn about adjective clauses and the importance of the correct relative pronoun and punctuation. Learn about adjective clauses and the correct relative pronoun and punctuation. This tutorial focuses on restrictive clauses. Learn about adjective clauses and the correct relative pronoun and punctuation. This tutorial focuses on nonrestrictive clauses.